Rory McIlroy made a faltering start to the defence of his title at the Wells Fargo Championship, carding a three-over-par 75 to finish the first round 11 shots off American leader Bill Haas. McIlroy, who was 22 on Wednesday and this week moved up to six in the world rankings, fired five bogeys and two birdies in a topsy-turvy round. By contrast, Haas sank eight birdies to finish the day eight under par. Swede Carl Petterson leads the European challenge on four under. But the likes of Padraig Harrington, Sergio Garcia, Martin Kaymer, Justin Rose, Martin Laird and Paul Casey all failed to keep pace with the leading pack. Irishman Harrington fired four birdies and a bogey in an encouraging three-under-par 69 to sit alongside Spain's Sergio Garcia, while world number two Martin Kaymer of Germany finished six shots behind Haas after an inconsistent first round where four birdies on the front nine were interspersed with two bogeys. English pair Rose and Casey - especially the latter - have plenty of work to do to get back in the mix following respective rounds of 71 and 78, the same score fired by Scot Laird. 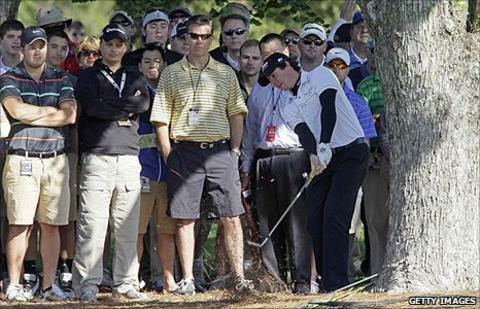 A year ago McIlroy blazed around Quail Hollow in a magnificent 62 to win his first Tour event. But this time, the Northern Irishman - returning to the PGA Tour for the first time since blowing his big chance at the Masters by finishing with an 80 in his final round - struggled to get his game going. "The story of the day for me is I really didn't hit it very well, which is unlike me," said McIlroy. "It'd be the strength of my game and today I just wasn't striking it well. My timing was off just a little bit." Haas, however, had no such problems in a blazing first round that saw him end the day with breathing space ahead of compatriots Jonathan Byrd and David Toms, with Lucas Glover and Pat Perez tied for fourth. "I've got good feelings around this place," Haas told www.pgatour.com. "I'm comfortable, I guess, out there, although the whole thing looks different with ropes and people and grandstands. "(Putting well) makes you more comfortable over your iron shots knowing that you can maybe miss this shot and your putter might save you because I just had the good feelings going with it. "It's early, and there's a lot of golf left to play, and I hope it can just work for some of that time." American world number four Phil Mickelson ended the day five off the lead following two bogeys and five birdies, and was happy enough with his round, saying: "I hadn't played in a few weeks, and to shoot under par was a good start. "It could have been a lot better, could have been a lot worse. I'll certainly take it."